STEPHEN NEAL. Autograph Note Signed. 1 p., 8¼ x 4¼ in. In the debate in the C. [Congressional] Globe, you will see that the great Statesman and true patriot, Hon. 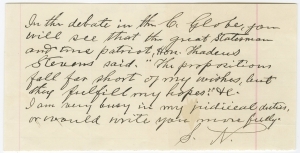 Thadeus [sic] Stevens said “The propositions fall short of my wishes, but they fulfill my hopes.” &c. I am very busy in my judicial duties, or would write you more fully. Stephen Neal (1817-1905) was an Indiana lawyer. He served in the state legislature and was later a judge. In 1866, he drafted what would become the 14th Amendment to the U.S. Constitution. Legend has it that he presented it his friend, Indiana Congressman Godlove S. Orth, and that Congress passed the draft as Neal had written it. This is unlikely; Ohio Congressman John Bingham is usually given credit as the amendment’s principal author, to say nothing of Congressional machinations that make passage of anything without revision nearly impossible. From the Congressional Globe, June 13, 1866, p. 3148.